The journey to this place began a while back. A while back when someone asked me why I don’t blog seriously. I dilly-dallied. The Kikuyu in me could not wrap my mind around how I was going to spend money to host my site. So I brushed him off. I told him I blog for fun. And who are you to judge me? Okay, I did not tell him that but that is what I was thinking. We all think that when we know we should and can do more but we don’t want to. Laziness. For a while now I have learnt that you all love edifying information. I have realized that you love reading if the content adds value to your life. I have met people who only know me via my blogs. I have even got proposals from some other Kikuyus to make money from blogging and split it with them. Cough. All this got me thinking. I needed to stop playing. I needed to go hard or go home. I was not doing this for me. I was doing it for us. For that girl who is Googling what his hug meant. For that guy who needed to know how life in Moi University is like. I needed to establish a platform that offered information on those trivial matters (depending on how you look at it) and future issues. This site is in no small part inspired by peer pressure. My blogger friends all got domains this year. Even my non-blogger BFF got two on the eve I launched this one in secret! This site was pulled together by myself, with tons of help from Barrack. Armed with the will and an Internet connection, we got to work. It was on the 23rd of April 2014. Looking back at the chat, I can’t help but laugh. S: Sawasawa. Now tell me what should be the first step to get my domain. I am very serious now. So serious. I need to get serious with my life. S: shikungigi.com. We already already established that. How much is it? The rest, as they say, is history. If you have thoughts on moving your blog to your own domain or you have been wondering what it takes, this is for you. After making the decision, the next step was setting up on Sasahost. Paying up for the hosting took a few minutes really, Ksh 2,320 for domain registration and hosting. In between instructions from B and my multitasking, shikungigi.com was live. The next step was to install WordPress. I did this amidst B literally shouting in my ear (if he could) and getting lost in my unending rumblings over Hangouts. It’s never quite the same, talking and chatting. 1. A lot of people host with Sasahost. I did not just take B’s word for it at first. I had to ask around just to be sure. 2. You can check who owns a certain domain on who.is. Just for fun, I checked out wanjikungigi.com and it was taken. B says we Kikuyus ran out of names thus the proliferation of Wanjikus. Oh well, I don’t need that one. 3. You need to extract all the WordPress files in the right folders for things to run right. And not doing it right is not the end of the world. You can undo most of the moves. Oh, you also need a database, clicks away thanks to the graphical CPanel. Day two was look-for-a-WordPress-theme day. I am a sucker for the medium.com look. And boy did I search for a theme that is medium inspired. Google grew tired of me that day. Turns out I am not the only sucker for that clean, focus-on-the-content Medium look. (Of course you are not, Shiku. Get over yourself.) There are tons of blogs that discuss medium-like themes for WordPress. None of them makes the cut though. I installed five themes, still tucked away in here. The closest — at least to me — was the one I currently have. WPMedium. It has no left sidebar that toggles out of sight when you click away. B was also part of the quest to turn the web upside down for a theme. He stumbled upon this awesome one that I cannot even imagine buying right now. Cough. I am still, after all, Kikuyu. The closest theme to Medium right now is Ghostium. It is not even a WordPress theme. That was the point I learnt there’s a whole other blogging platform called Ghost upon which Ghostium runs. Let’s just say this is not the end of my search. I decided to leave it at that for now. WIP. Later on the same day, I began to import my blog posts from Blogger (blogspot.com) and WordPress.com. Quick lesson, just in case you don’t know this. Downloading WordPress on your own self-hosted blog means you are now in the WordPress.org crowd, like we are now. If you opened a blog on wordpress.com, you still need to import your posts if you ever make a move. The good thing is, WordPress has the import tools for this purpose. It is a pretty straight forward move and takes minutes, depending on how many posts you had on your blog. I hit two snags at this point. One. I am the bright Google+ evangelist that had turned on Google+ comments on blogspot.com. Google+ comments cannot, obviously, be imported. They are however still floating around on Google+ space. I moped over that for days after this but I had to let them go. Otherwise, all other pictures, posts from both blogs and comments from wordpress.com were brought along here. Two. I had turned on Publicize before I started importing. Publicize is a feature available on an invaluable plugin called Jetpack. Jetpack turns your self-hosted WordPress site into one that has all those sweet little features available to wordpress.com users. Forgive me if it is getting too technical. You will need to know this. So what did Publicize do? As the posts imported, it posted every single post I had ever written to my social networks without my knowledge. I only knew about it when an enraged (slight exaggeration) tweep told me I was filling his timeline with automated nonsense. Lol. And that was how a few people discovered this place before it was ready. So much for a grand entry into the world of serious bloggers. In retrospect, that was a pretty stupid move. Publicize and all other automatic sharing tools should be the last thing you ever turn on in this process. I was so excited about day three. This was the day I was going to redirect my existing blogs to this one. In layman’s terms, I was to make sure that whenever you clicked on the link shiqoue.blogspot.com or wanjikungigi.wordpress.com, they would lead you to a similar post here. I would be lying if I said it was that easy. Actually, look for that person who told you good things come easy. Look for him (it’s likely to be a him) and smack him in the face for feeding you with the biggest deception this side of the Sahara. Then do not listen to him ever again. Both Blogger and WordPress have official ways to redirect. Blogger gives you addresses to configure on your DNS settings. I did this with timely help from a customer care rep at Sasahost. Needless to say, that was a disaster. I ended up having two completely different sites. One with the www and one without. I ditched that redirection and asked Sasahost to revert back to original state as soon as possible. WordPress on the other hand, offers a paid solution for redirection. There was no way Shiku was going to pay for redirection for only 22 posts. Thank you very much. So here we are. I have just shut down the two blogs. My work deskie also gave me pointers to achieving that left sidebar look. Off canvas navigation is what he called it. Don’t I just love this learning curve. I will get around implementing it one of these fine days. New things. New resolve. Smarter work. Welcome to Thoughts and Stuff. If you are setting up your own domain, all the best. Update: I did buy that awesome theme. I find it very hard to drop for another, years down the line. Love it. Oita by Elmastudio. I am having one of those days I could easily pull out my hair (what’s left of it, that is). Fortunately I am in a head scarf so that thought is stopped in its tracks right there. I had this elaborate plan set out for Wednesday. I’d hit my desk and type away a post for work in a matter of minutes, schedule titbits and move on to other things. Unfortunately, that is heavily reliant on the Internet. Plus bright Shiku did not write it on Word first. I did it directly on WordPress so I cannot even build on it now. Argh. Anyway, all I can do is blog (on Word and publish it later). I have lots to blog about but can’t pick out one thing. So I picked one of my many drafts. Yes, I have loads of drafts hidden inside these blogs. Some never see the light of day. Let’s see which one gets to be the lucky one today. It’s been a while since I wrote about movies. I rarely do it. The last time I did, it broke me into a thousand pieces and made me think. So I watched Noah. The movie is doing well according to box office ratings though it dropped from 2 to 5 this weekend. Word of advice. If you go into the movie thinking it is a Christian movie, kindly rethink that. It is not. It is basically like any other Sci-Fi movie for a good part of it. I will not spoil it for you but consider yourself warned. You will get annoyed, laugh at the absurdity and breathe a sigh of relief now and then. When the movie ends, there will be an eerie silence in the cinema hall, or wherever it is you will be watching it. Like what in the world did I just watch? Is that it? Even Russell Crowe won’t make you feel any better. Russell and Jennifer Connelly are hubby and wifey once again, like in A Beautiful Mind. But this is nothing in comparison. I could rewatch A Beautiful Mind a million times and still cry a river. I did not shed a tear in Noah. I guess there are lines to be drawn in fictionalizing true stories, especially if everyone knows what will or should happen. I rest my case. Tell me when you watch it. By the way, it is still a great experience in 3D and even greater if you love movies with fake machines like Transformers. Okay, seriously, I rest my case. In other related news, I got wind of the movie Heaven Is for Real and went Googling. And what do you know? The movie is based on an actual book that was written by the little boy’s father. So that is what I am currently reading. Will tell you all about it soon if it makes me inspired enough. The movie will be released in the US this Easter weekend. How timely! Then there is God’s Not Dead. Number 7, box office this weekend. God’s Not Dead began with the Newsboys “God’s Not Dead (Like a Lion)” track that was downright awesome. The video too. The movie which features a Kenyan has been hyped in Christian circles for quite a while. I specifically look forward to watching it because I know what it means to be in a lecture where lecturers challenge your faith, or social media for that matter. I am yet to watch Son of God. The hype and associated criticisms behind all these movies are expected. I love these kinds of times when everyone has an opinion about everything. I listen, take mental notes and move on. Net is still not back so let me figure out what else I can do that I have been postponing. There is very little I can do in my line of work without Internet all the same. My Safaricom modem is practically useless at my desk for some strange reason. My phone too can hardly connect though I am still insisting on publishing this using the Blogger app. I will edit and insert all the links later. And here I thought I was a few kilometres from Safaricom House. See you when you see me! Google+. A lot of Kenyans online are not actively on it. Any time I bring it up in an appropriate situation, people brush it off. Those on it are simply so because they have a Gmail account, not because they log into it and engage in activities within it. Well, I am here to tell you this: you are missing out. Jump on the Google+ bandwagon now. I am not marketing, neither am I exaggerating, I am just giving it to you straight. I’ll begin with the reasons you should be on Google+ as an individual, even when you’re not a blogger. When you are really bored in the office, just visit Google+ and I promise you will laugh through the afternoon. Of course you have to follow the right pages to see the hilarious gifs. (I love the cat ones for obvious reasons.) There are specific pages dedicated to everything funny. Hangouts. Okay, Facebook has chat and video too but who else lets you have a group video chat for free? Only Google Hangouts. Plus it is integrated with everything Google, from Gmail to Youtube to Google Drive so you can share so much in one joint. Say you want to send a Youtube video link while you chat but can’t remember the url, just search for it right on the hangout and send! The Android experience is definitely not complete without a Google+ profile. I am not a fan of having my background data on (unless there’s free Wi-Fi around) or sharing too many pictures online but if you are, you can use the Auto Backup feature, allowing all your photos and videos to be uploaded to a private album after which you can share at your disposal. Now for the part I am really passionate about, for all you bloggers and companies seeking a strong web presence out here. I started this blog in 2011, just to share my thoughts about random things. Google+ came on later and I got in when it was accessible by invite only. I didn’t see much to write home about. But that is the thing about new products and services in the technology world, you have to give them time. So I did. 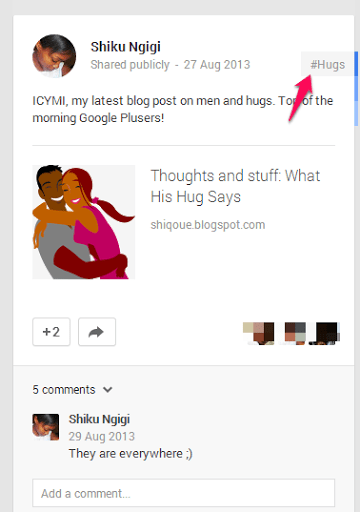 I integrated my Google+ profile with Blogger and much later, used Google+ comments on my posts. Integrating Google+ with your blog is a great plus, literally speaking. A comment, a reshare or a +1 automatically gives your post more visibility on Google’s search results. Do I need to go into the details of why you need to be visible on Google? It’s their social network so obviously they promote posts made on Google+ better than those on Facebook or anywhere else. Provided you have the right content for your target audience, then you will definitely find your page up there. Grab the opportunity to write while everyone is sleeping through the Web revolution. I can assure you that a lot of what makes Kenya is waiting to be published online, people are just not serious about it. One, it shows the number of people who have you in circles. If you have a good number, you will obviously appear like an authority of some sort (whether you are one or not). Two, an image on a search result is bound to grab the attention of the searcher, especially if you are really photogenic or simply know how to pose ;). Three, you are well on your way to establishing a personal brand in cyberspace as you are finally appearing everywhere relevant as an information source. This guy here explains it so well. You will have to verify your email address on Google+ to seal the deal. The whole process, including linking your profile to your content is known as Google Authorship. Even WordPress realized they were doing the world of blogging wrong by not having Google+ as part of its integrated features. Now, an author can log into WordPress with his/her Google+ account and automatically share a post and get Google+ details displayed. There is a wealth of Google+ I have not explored. I will as days go by and it morphs into something more awesome. See? You are missing out. Become a Google Pluser today, or at least start a page for your company.